CAMINO WALKING BLIND 2017 - Be your true self! For the third time we have walked to Santiago de Compostela, this year starting in Molinaseca. 6 people with a visual handicap and 6 buddies, after a successful Camino Walking Blind in 2015 and 2016, organised by Foundation Anders Bekeken. Read about the team, their motivation and experiences. Walkers: Henriette Vrij, Annemiek van Munster, Petra van Paassen, Machteld Cossee and Leo van Rijt. Buddies: Leo Scholten, Dorothé Garé, Jet Alsemgeest and John Pannekoek Loois. Her motto: "Together you are strong." Henriette applied to join us as a buddy. "I find it very important that people who really can't see anything are able to make such a journey. I would be happy with the support of others when my eyesight gets worse." She has severe glaucoma, and feels partly visually impaired. She has stopped a promotion research because of this eye disease. It made us ask her the question if she wanted to come as a walker. It was not what she expected, but she said yes. "For me it is about making a new start, and letting go of the feeling 'I can do this alone'." "Camino Walking Blind has put things in motion in a positive way. Though my sight deteriorated, and I need another operation, I am open to how I can proceed now. I think I have let go of 'not being able to do things anymore and loss' to seeing possibilities. It is not that I am not sad about it, but I feel more open to face what will be on my path." Her motto: "Don't postpone the things you really would like to do." "I asked myself why Camino Walking Blind 2017 came onto my path. There must be a reason for it, as I don't believe in coincidences. So that's why a applied for a place and I will see what comes my way. The Camino is a moment of peace in your life. Back to basics, letting go of everything. Luxury and social media you leave at home. Slowing down, coming closer to your self, finding out what you really want, what you can and how to manifest this. With this Camino I would like the walker I am walking with to feel, see and experience the same. This can be intense, looking at myself." "Life as a pilgrim is beautiful, back to basics, just walking, eating and sleeping and enjoying the peace and nature. No problem to walk with a backpack, the food was good and it was wonderful to assist the walkers with a visual impairment, whenever they needed it. We had great conversations and I appreciate the confidence that was given and received." Annemiek is blind on her right eye, left she has 0.15 - 0.20 sharpness, with 30 degrees field of vision. Her motto: "Live your life day by day." "When I saw the advertisement I thought: Yes, this is what I need in my life right now. Nine years ago I have followed a rehabilitation program. With all new skills and accepting my situation I took up my life again. Work, sports, friends, I had to do it. In a good way, being aware about my impairment and with many tools. During the years I stepped back into old habits crossing again my own boundaries. My will was so strong, but my body couldn't follow. Work was not a success, my new novel was rejected time after time, I couldn't do other work, my relationship ended and worst of all my sight was going worse. I got into a deep depression. Me! Who had learned all so well! Again! The beginning of this year I got back onto my feet. With new insights. I want a different life, with a most important conclusion: I am not going back to work. I have been declared unfit, I have tried it for nine years and I can't do it the way I want to. My sight has gone worse and I have to be careful with what I have. Work doesn't define me anymore as a person. An enormous change for someone as ambitious as me. I am taking life as it presents itself. I don't let myself being defined by what other people think of me. I live my life day by day. I want to use this pilgrimage to reflect on this big change in my life and I want to leave my old life behind me. I am proud to have done this, but deep inside there is this little voice saying: looser. And I want to let go of this completely. This pilgrimage is an instrument to help me reflect, to have a good honest look at myself, by walking and exploring my boundaries, stepping outside my comfort zone and meeting new people so I can see myself with different eyes." "It is the simplicity of a pilgrim's life, walking, being part of a team, the buddies, the hostals, eating and enjoying. Back to basics, good conversations, and on every corner a new surprise. Living outside your comfort zone. 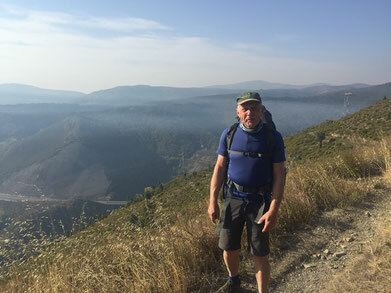 We are all the same in this, though without Camino Walking Blind I would never have been able to experience this as a visual impaired person." His motto: "A wonderful initiative!" "I can't exactly describe what makes me a good buddy, I am a good listener and, if necessay, a good talker to understand the other. It is every time a new learning proces from both sides. My added value can be my optimistic and non judgemental view and having a positive input in consultations. The courage to letgo of your certainties for both sides and to join in an unknown adventure with the others. To get to know people with an impairment what I have no idea about (I have had an operation for cataract and it made me feel insecure in the evening and in traffic). 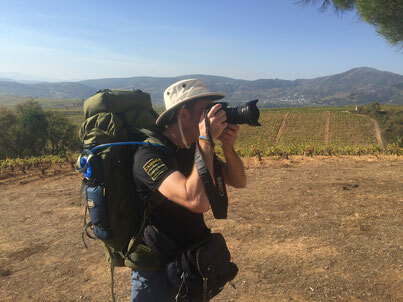 The Camino give me a feeling of responsibility, for the people I am going to Spain with and for myself, and a feeling of making it a success." "The first steps in Molinaseca and Ponferrada felt a bit unreal. One moment you are at home and within a day you are somewhere in Spain in a totally different rhythm. At the end of the first day from Molinaseca to Ponferrada, it was hard work. Feeling the tension to walk with someone who hardly can see, being overly worried and trying to do everything perfect, was not working in my advantage." Petra is born with cataract and has involuntary shocking eye movements. "Percentage wise I see 12%, stable and total view. In a familiar environment I can do all the things I want to do." Her motto: "To want something is being able to do it." "The Camino to Santiago, the path of my challenges, is highly on my wish list. What I expect of it is an exceptional life experience with unexpected happenings. What I bring is myself, with as little ballast as possible. What I leave behind is the hectic pace of life and its intrusiveness and all the persons who are dear to me. What I hope it will bring is an inspiring and insightfull experience being able to understand myself better. Being visually impaired, it would be very difficult to walk this path alone. To walk with a group of twelve persons, all with their own motivation to walk this pilgrimage, feels like a unique experience and challenge. After six years (of hard work) of personal development, awareness and processing life until now it is time for some quietness and space. Step by step walking this path of life." "It brought me closer to myself. My motivation was to find peace and space. Now looking back I also went for myself, being at the end of a process. Being back home the real pilgrimage starts. Yes, I really needed this journey to observe well. A beautiful seed has been sown: I am allowed to be here!" Her motto: “"Make the best of what is given to you." "I expect being a buddy will be a special experience describing what there is to see, hear, smell and feel and that this will intensify on the way. Though I don't expect it to be easy. Away from home and being part of a group of strangers is an excting undertaking. Walking every day, which will slow down time, and its physical achievement combined with being a buddy, will test the senses and mental toughness deeply. I don't underestimate this at all, and I don't want to be scared by it either. The Camino will personally offer me space to slow down, to create distance and time for reflection. I hope to get more insight how it is to be living with a visual impairment and I am curious about their perceptions. This knowlegde I would like to use for impaired students in general, as I work as a dean at the University of Maastricht. Althogether I expect to learn a lot from the Camino about boundaries. Helping to push the boundaries, to get more insight in dealing with boudaries and guarding my own boundaries." "I have learned it is okay to step outside my comfort zone, and for it to be a beautiful experience. That we all look alike, and the big themes in life are more or less the same for all, and being able to trust yourself in approaching others. Visually impaired persons and also others with a functional limitation don't derive their identity from their handicap, as we might presume. I think I have learned to see people with a functional limitation in a different way." Machteld has a visual and auditory handicap (Usher syndrome). "I am born with a auditory handicap and from my 17th year I am also visual impaired." Her motto: "Nothing seems as it is." 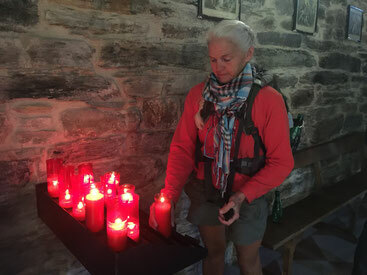 "The last years of my life have been a continuous personal struggle and the Camino seems to be a perfect moment to reflect these past years and to get a fresh perspective to the future. Getting away from home and physcial excercise every day might be the perfect combination. A few years ago I started running with Running Blind. I never thought I would love it this much. Though I am quite competitve and running I always want to set a new pr. I am looking forward to walking the Camino, and I don't need to make it a competition. This already gives me a relaxed and good feeling. Being part of a group, all strangers to me, I find very interesting. It is part of pushing the boundaries." 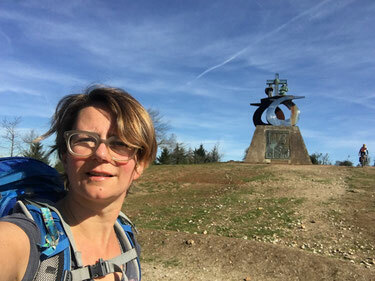 "Being away from home with Camino Walking Blind for a longer period of time, stepping out of my role as a mother, partner and friend I could meet my 'self' again. And I realised I am also a nice person without all these roles. It has given me more peace of mind about my future, I don't have to do everything now. I can do things later, even though my hearing and sight will be less." His motto: "I find my space in a group." "An advertisement in a walking magazine got me interested. Walking the Camino has always been a deep wish for me, but due to circumstances it never happened. I have made a walk last year with someone who had done the Camino. He also made me very excited about it. I have experience working with groups and am active in voluntary work. As a remedial teacher and care coordinator I have experience working with persons individually. I hope I can use this experience and my experience walking with Camino Walking Blind. 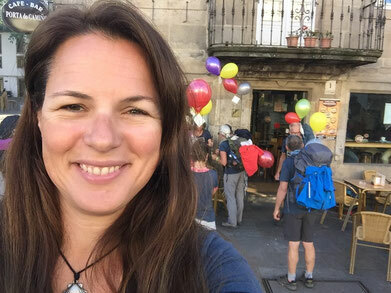 It will be my first Camino and I understand it will be a unique experience." 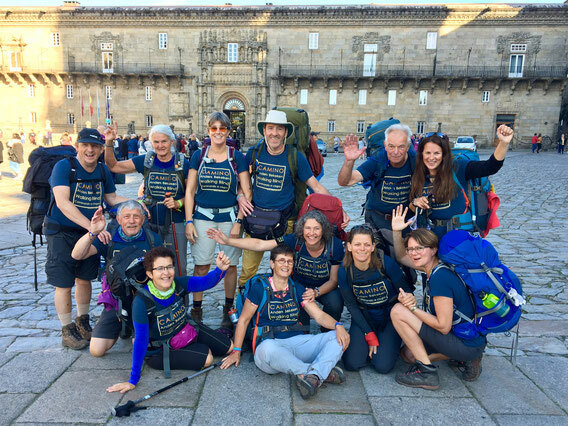 "The success of Camino Walking Blind is about meeting eleven beautiful people, doing things together, having fun, and helping each other where necessary. In a very short time twelve 'strangers' have become dear friends." Leo has retinitus pigmentosa. RP is a hereditary eye disease. "I see about 2% of what a well sighted person sees." His motto: "I believe in the power of a good conversation." "I have heard enthousiastic stories about the Camino from people who have walked to Santiago de Compostela. I have been dreaming about it, how and with whom I would make this historical journey. I love walking and I am deeply interested in art, culture and architecture, as I used to work as a senior designer. I also love a good mental and/or physical challenge. It fits my philosophy of life. I believe we all shoud follow our passion and talents and not abandon them! I have always embraced this philosophy. My contemporary status as being blind has not altered this. Neither did this happen in 2015 when I had to stop working, as of a gradual degeneration of RP. It was the day I had expected coming and not being able to deny my severe visual impairment any more. It was the day my house of cards fell apart. A beautiful structure I had worked on with such enthusiasm, but also known for a possible collapse. The connection of the foundation had lost its power and it was not possible to restore it with the help of colleagues. I feel very happy that my enthusiasm and willpower still is my motivation. Without perseverance and creativity I wouldn't have been able to work passionately for 36 years. 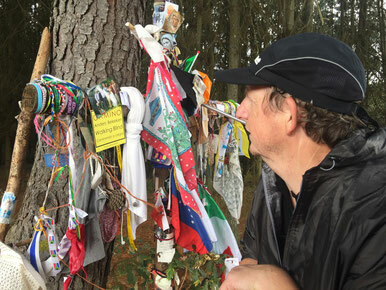 The Camino for me is a test to find out how I have mentally endured these last years." 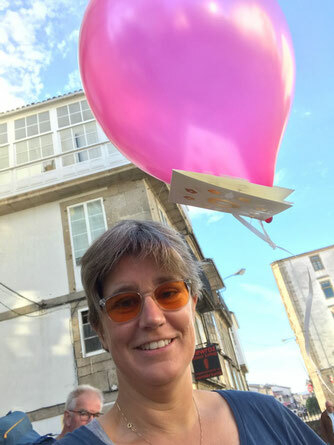 "Underway in our taxi bus from Santiago de Compostela to Molinaseca, I am getting more aware of the journey ahead of us; a distance of more than 200 km. With the time ticking away I am having serious doubts; walking 200 km! 'Would I be able to do it?'" Sofie Mangnus was a buddy in 2015. 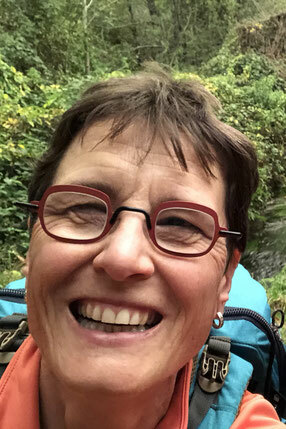 In 2016 she joined Foundation Anders Bekeken and she is part of the organisation of Camin Walking Blind. 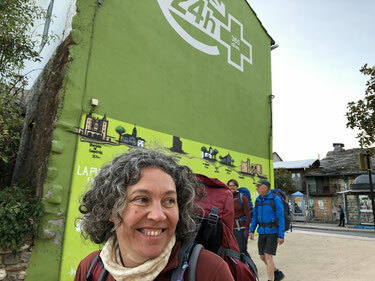 Her motivation to walk the Camino: "Just walking, and experiencing and sharing what is at that moment. It gives time to reflect and to ask yourself who you are and who you want to be." Séverine Kas has a visual and auditory handicap (Usher syndrome). 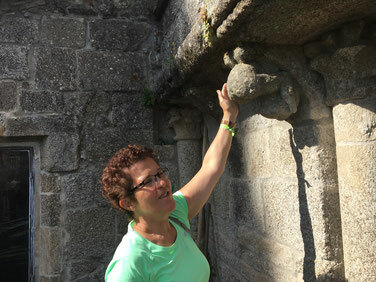 In 2015 she deeply experienced the power of the Camino as a participant. Since 2016 she is part of the organisation and chairman of Foundation Anders Bekeken. 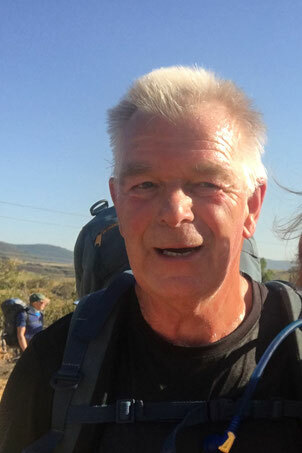 Gert-Jan de Hoon is one of the initiators of Camino Walking Blind in 2015 and co-founder of Foundation Anders Bekeken. "This pilgrimage in 2015 was a very special experience to be part of. I guess we already knew back then that we would do it again." In 2005 he walked the Camino for a first time as a pilgrim. And the Camino kept calling him back ever since. About his experiences he wrote the book A pilgrimage to Santiago. As a life coach he walks with groups and indivuals in the Netherlands and abroad and also on the Camino in Spain (Camino Coaching).